In the course of the day yesterday a very sad message reached us. 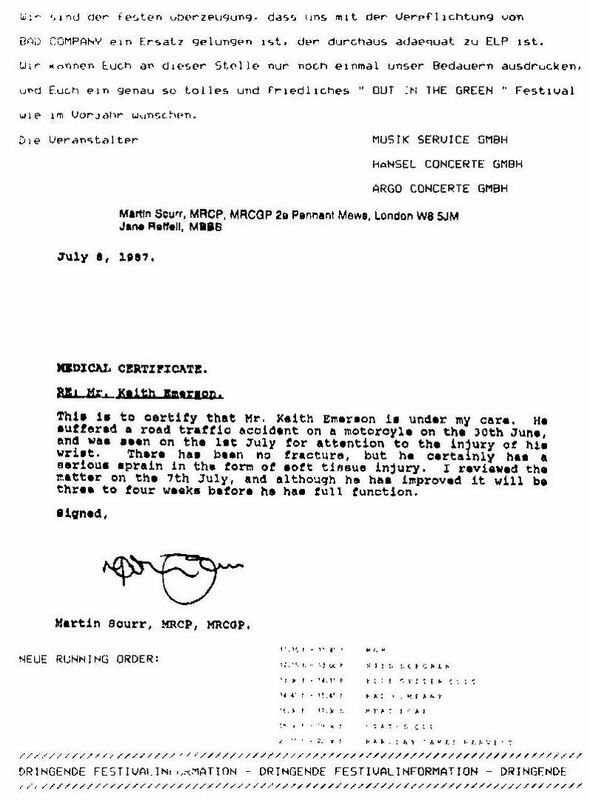 Keith Emerson had a very unfortunate accident with his motorcycle on the way to his home from rehearsals with ELP, for the "Out in the Green" Festival, and he cannot play, under any circumstances, on instruction of his physician (see medical certificate) at this festival. With a heavy heart ELP announced their appearance as off, for which they had rehearsed several months in the studio. ELP and the organizers of the Festivals apologize in this way to you all for this unfortunate circumstance. Despite everything, we would like to stress however that nobody can be blamed for such a tragedy. We ensure you here, that ELP is most concerned by this, since these festivals should excite world-wide attention as a starting signal for their comeback. 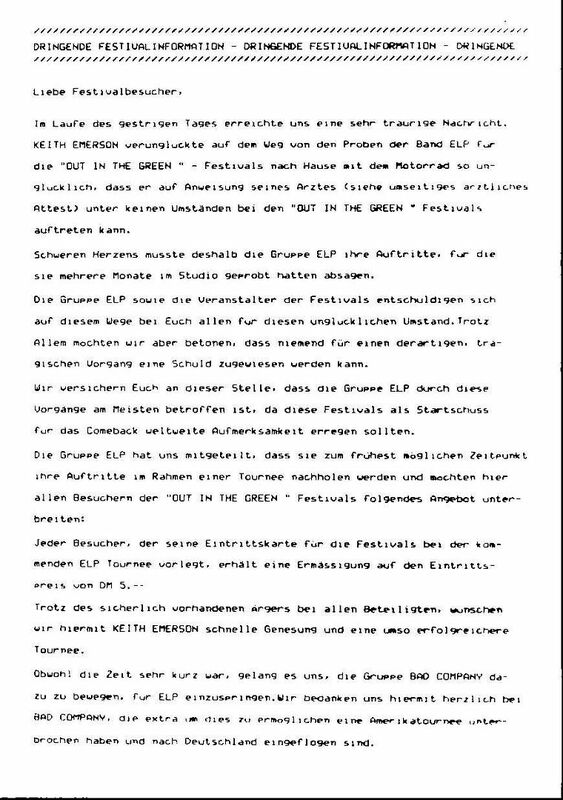 ELP communicated to us the fact that they will reschedule their appearances at the earliest possible time in the context of a tour, and would like to submit to all visitors of the Festival the following offer: Each visitor who submits a Festival ticket when attending the coming ELP tour, receives a reduction on the admission fee by 5 Deutsche Marks. 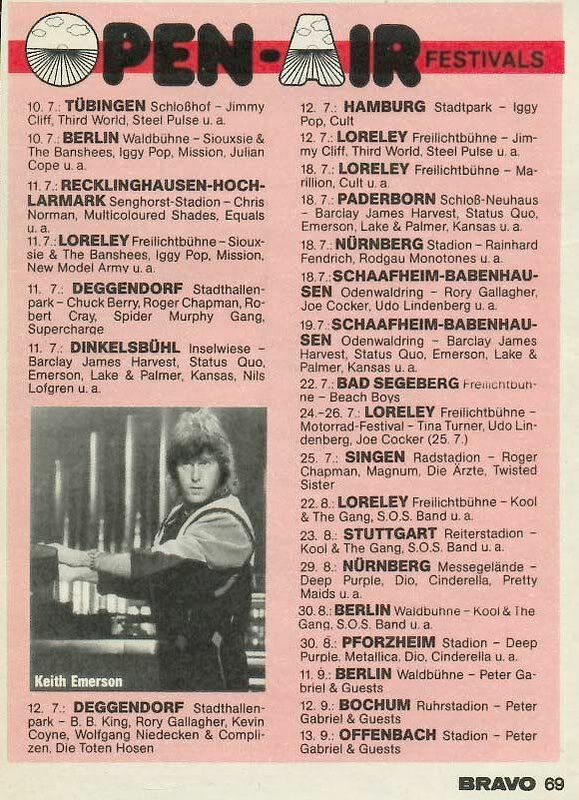 In spite of the unfortunate circumstances with all involved, we hereby wish Keith Emerson a fast recovery and a very successful tour. Although the time was very short, we managed to procure the group Bad Company to replace ELP. We hereby cordially thank Bad Company, who interrupted an American tour especially to make this possible and flew immediately to Germany . We are convinced that, with the appearance of Bad Company, a suitable replacement was found in lieu of ELP. We can only again express to you our regrets, and wish you just as great and peaceful a festival as in the previous year.